I buy mine at Food Lion, but I’ve also seen them at Harris Teeter. You can also try this product locator on their site for other options. Good luck! I heart quiche. I like all different ones. so good for breakfast. hubby loves it when I make him different quiches. 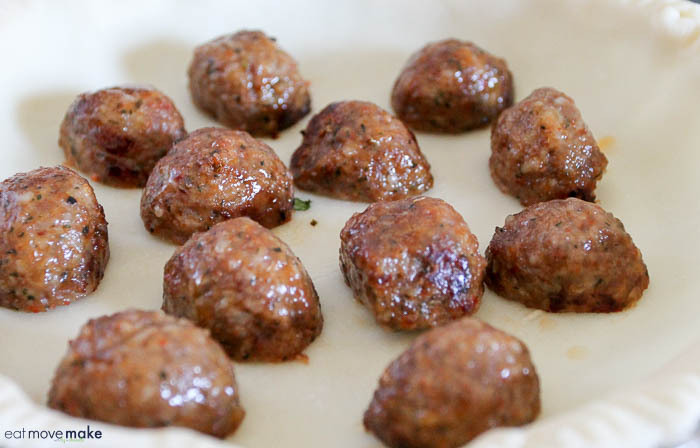 These meatballs look almost like freshly homemade, I haven’t seen them in a store here yet. This looks really good! I might make this for when family stays during the holidays. Uhmm that looks yummy. I love meatballs, and cheese added. It’s definitely stomach fuller. Thanks for the recipe. Looks like a fantastic addition to weekend brunch. So many wonderful flavors, I need to find these meatballs at my grocery store. Dinner is usually the one meal that families have together and hence a good opportunity for bonding and exchanging notes on the day. I too have fond memories of our family dinner together when I was a kid. The red pepper in the Caprese Quiche looks pretty exciting. We love to spice up our food too! Delicious! I usually make meatballs from scratch but if there are a perfectly seasoned frozen meatballs available at the store, then that would be great. It would cut down on the time to prepare a meal. I love you quiche. It does look really mouth watering. 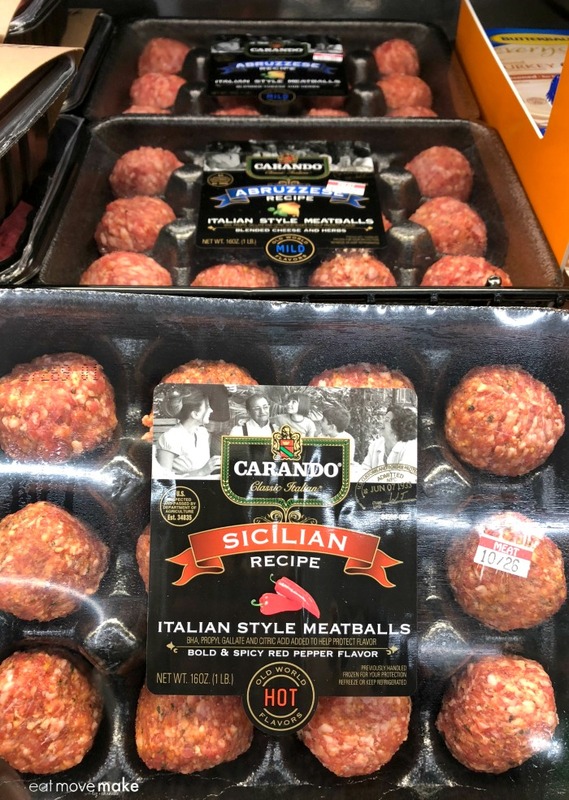 I have seen these meatballs in the store before! They look so good and homemade! I never thought to use meatballs in quiche, awesome idea! Already made and shaped meatballs?? Yep, I need to find these pronto! Much easier because I don’t like being in the kitchen too long. I’m going to look for these meatballs. Some of those frozen ones are disgusting. I would love one of these for dinner tonigh. I always make quiche but haven’t tried incorporating meatballs in it. IT looks and sound delicious! Wow what a pie! And you put meatballs in this that is brilliant! This looks really delish! Such a great breakfast idea! That looks really good! So perfect for weekend brunch! This looks delicious! I love a good Italian recipe. I might have to try making this soon. We have company coming into town and I think they’d enjoy this. I’m a vegetarian, but my husband and kids aren’t. Rolling meatballs myself isn’t my favorite so buying them already made is going to be such an upgrade. That quiche sounds like it’ll be a hit. 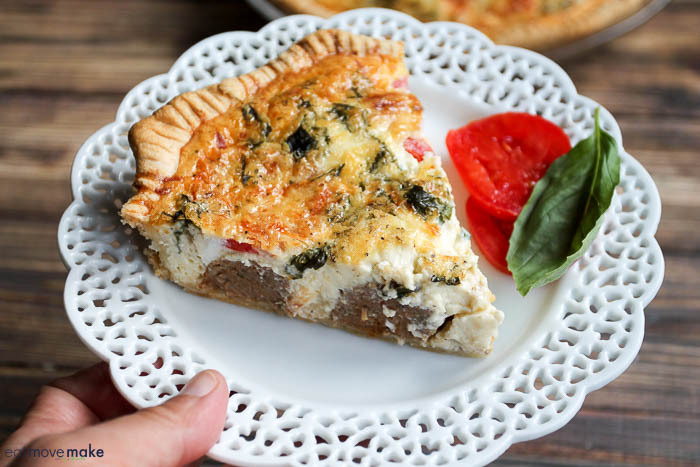 I love Caprese anything and this quiche sounds amazing! I will have to try this for sure!! It would be so nice to make this for dinner, it’s quick thanks to the meatballs and the ready made pie crust. Thanks for the recipe! I’m sure my family will enjoy it as well. There’s nothing like making meals that remind you of your childhood! I miss my mother’s cooking and make our family recipes most of the time. This sounds lovely. That quiche looks amazing and it’s definitely something that the kids will enjoy especially with the meatballs. I think it’s a must try! I love that the ready made meatballs makes the recipe easier to prepare. 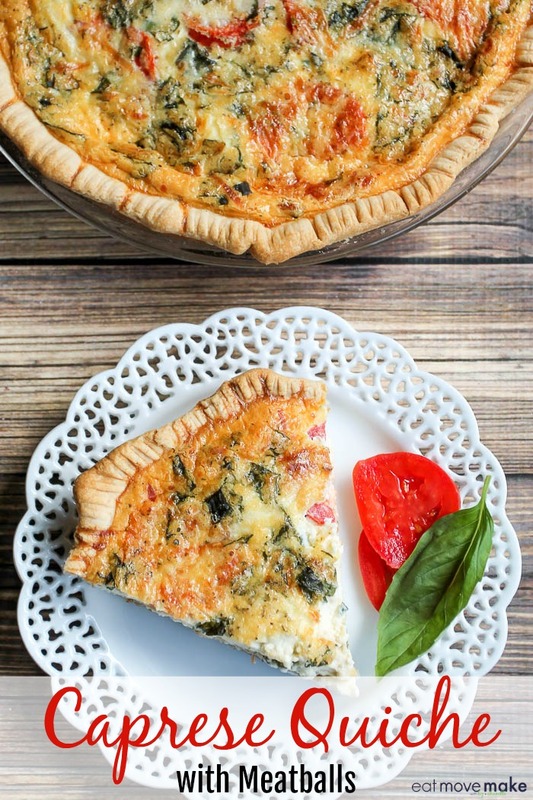 We love quiche, and I will have to try this recipe. I never thought to use meat in quiche, but it sounds delicious. Caprese is a favorite of mine! I just made quiche the other day for the first time. It is actually really yummy! I love this idea adding meatball in the quiche. I need to try this! Wow. This quiche looks so delicious! I never even thought you could add meatballs in a quiche. I will copy your recipe but I will make mini ones and use a muffin pan. It would be an easy, ready to go meal for my family. Thanks for the idea! That looks so good. I haven’t had quiche in such a long time. I’ve never even made it myself before. Can’t wait to try this. This looks so delicious. I love caprese and quiche. I like the idea of adding meatballs to it. Now that is different. I may give this a try. Such a delicious looking dish and I love the meatball inclusion! 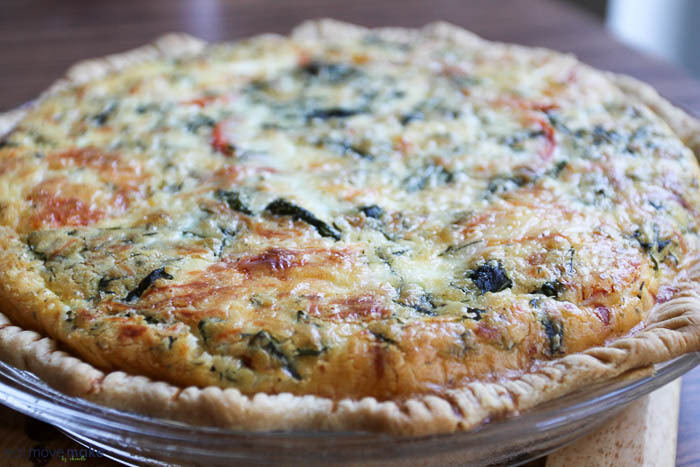 This tasty quiche would be great to serve at an upcoming brunch. I love Caprese, but I’ve never had a Caprese quiche. I bet adding meatballs makes it so hearty and filling. You are making me hungry. That looks delicious! This looks so yummy! I have to try to make this one! Meatballs in quiche sounds really delicious. i would love to try some. I have made meatball quiche before, but never a Caprese meatball quiche. It sounds great, doesn’t it? 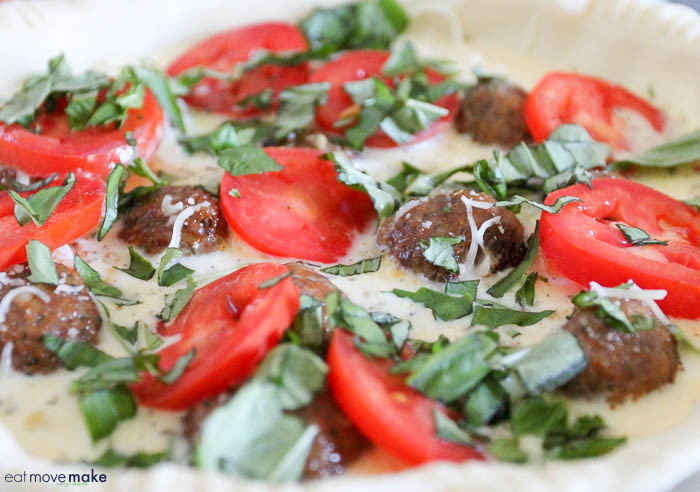 Caprese quiche with meatballs looks so delicious and easy to make. I am always looking for new recipes to try. I will have to add this to my meal plan for next week. 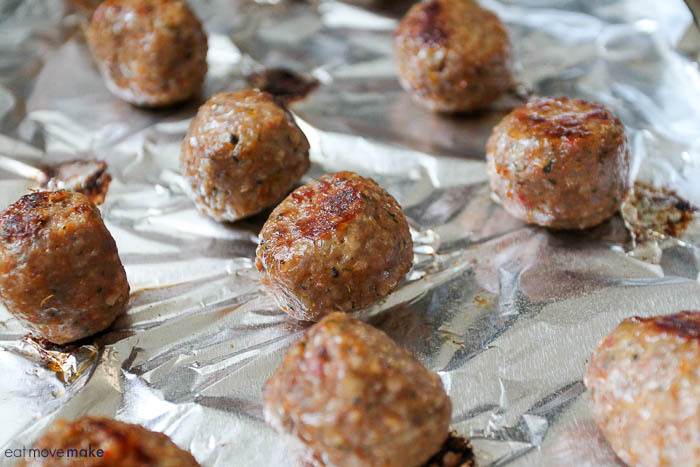 No way those meatball would make it from the oven to the recipe without my kiddos snagging one or two of them for themselves. 😉 I too like when a store honors my time!! I don’t have enough of it, that’s for sure. The quiche recipe looks great! I’ve never made a quiche before. I’m not even sure I’ve ever even tasted a quiche before to be honest. Your Caprese quiche with meatballs does sound intriguing though. I would give it a try! 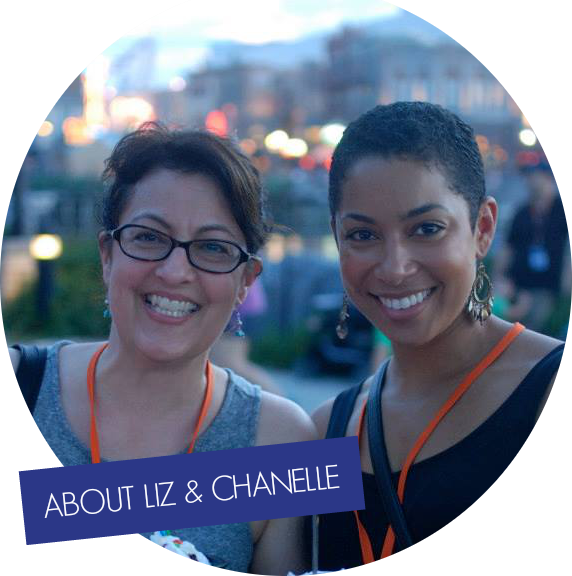 It all definitely looks amazing, Liz! Your photos really highlight the deliciousness of all the great ingredients from start to finish. Yumo! Woah this looks SO incredible! I definitely will be trying this out, I loove meatballs and LOVe a good quiche! This is a genius idea! Cannot wait to make this. Yum! I might be the only one that has not had quiche. But I would love to try this recipe as it looks delicious. I love everything about this. It looks delicious. 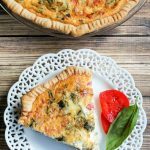 I have never thought about making a caprese quiche! What a wonderful idea. It is probably my all-time favorite type of salad. Why not make it into a quiche. I am definitely trying this. What a beautiful quiche, and I never would have thought to add meatballs! I love it! It’s funny how the prompt dinnertime hasn’t carried on through generations. Busy families these days! I love mealtimes with my family too, even now as an adult! No TV, no social media, just family and conversation. And this is a great dish to gather round for! Looks delicious. Your caprese quiche with meatballs sound and look super tasty! My family would be sure to love this recipe! What an amazing breakfast! I’ve never seen meatballs added to quiche before. I love the creativity, and it sounds delicious! Actually adding meatballs to your quiche was and is a brilliant idea. My husband might actually eat a quiche now that these meatballs are added. He does like his meat. I love quiche and I love a good caprese salad so you’ve already got 2 of my faves and then you add meatballs. Mind blown. This sounds so delicious. Wow I love a good quiche recipe and this one sounds amazingly delicious. I love that you put so many great ingredients into this recipe. I gotta try this one!! That quiche looks so perfectly cooked and tasty. I have never heard of meatballs in a quiche but it looks like a great surprise addition. I never thought to make a quiche like this but it sounds good! I am not much of a cook but I am really trying more lately! Yes please! I just love all things caprese. I just love that combo, so I’ll be making this soon! Plus I love meatballs! That looks so good! I can see serving this for breakfast, lunch, OR dinner. It’s the perfect dish for any time. Om nom nom. 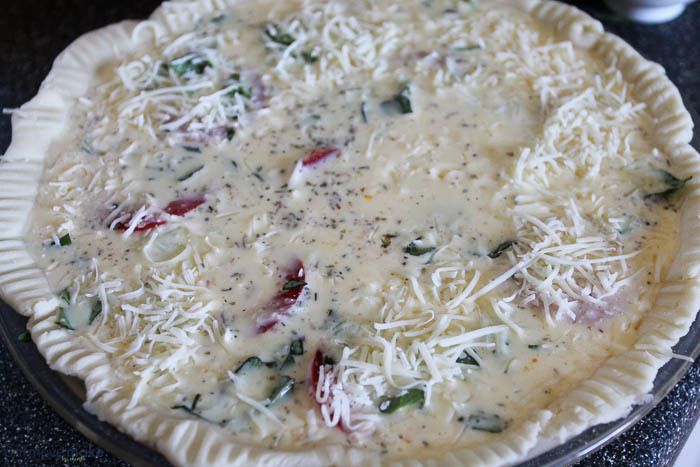 I love quiche…and this one really looks like something that will make me want to come back for seconds. Well presented! Wowza! That sounds incredible. I haven’t had a quiche in years, but this one sounds SO good. Alright, I have to try this for my upcoming brunch with my girlfriends. Can’t wait to see try this recipe. This looks so good. I don’t eat meatballs very often but may try these for Christmas!